In polite Victorian society one’s posture was very important as it was thought to demonstrate a person’s refinement. As a result, many contraptions and devices were marketed that purported to help deportment. In additions, night schools and ladies finishing colleges held instructive classes in how to sit, stand and walk. 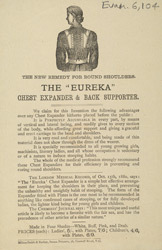 Many people wore supports like the Eureka Chest Expander under their clothes; indeed, the Expander could be purchased in a variety of colours and in ladies' or children’s sizes.